Most high school students heading for college will need some form of financial aid to make their education affordable. Fortunately, applying for financial aid is easy, and there are many government and privately funded sources of aid available for students in all walks of life. Even if you think your family does not qualify for aid, think again! The majority of university students in the United States receive some type of financial aid in the form of grants, scholarships, or student loans. Your first stop for financial aid should be the Free Application for Federal Student Aid (FAFSA). Your FAFSA will determine how much aid you are eligible to receive from the U.S. Department of Education. Many state governments use the information from the FAFSA to put together financial aid packages of their own, and colleges and universities also use the FAFSA to determine whether or not a student qualifies for scholarships or other types of aid that come directly from the college. Prospective students can fill out the FAFSA for their first year of college as early as October of their senior year of high school and get an idea of the types of aid available well ahead of time. If the financial aid provided by the federal government is not enough to cover the costs, there are many privately funded loans and scholarships available to make up the difference. Students can also seek out work-study opportunities, in which they work a part-time job on campus in exchange for money to put toward their tuition. Federal student aid comes in three forms: work-study jobs, grants or scholarships, and loans. The words “grant” and “scholarship” are sometimes used interchangeably. These types of aid are free money that students do not need to pay back. Some scholarships are need-based, meaning that the amount of money awarded is based on your family’s income level. Others are merit-based and are awarded to students with good grades, regardless of much money they have. Most students who make an effort in school can receive some form of aid, not just the very best students at the top of the class. Unlike scholarship money, student loans need to be paid back. The loan provider, usually the federal government or a bank, gives the student money up front to cover the cost of tuition, room and board, or other expenses. The student does not need to pay it back during their time in college, but after graduation, repayment begins. 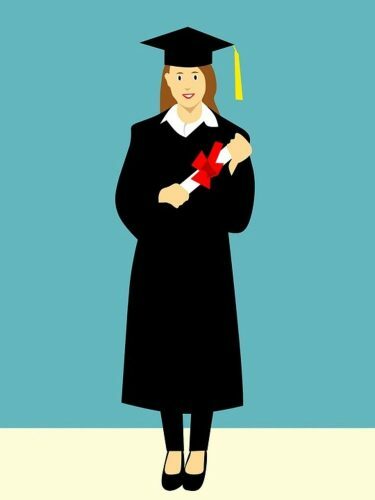 Because loans need to be paid back, it is smart to make sure you are receiving as much scholarship and grant money as possible before resorting to taking out a loan. Different loans need to be repaid on different schedules, and some loans come with interest that needs to be paid on top of the original amount of the loan and builds up over time. It is important to read over the terms of a student loan carefully to avoid missing payments. Graduates who experience a financial hardship and have trouble paying off their loans have many options to make these payments easier, especially if the loans came from the government. Federal student loans, generally speaking, are more flexible when it comes to repayment than private loans from a bank or other organization. Most financial aid advisors suggest that private bank loans should be a last resort. If you or your parents are a member of the United States military, there are additional financial aid options available for you. Under the GI Bill, service members who enlist and serve a designated amount of time on active duty can have some or all of the cost of their education paid for by the military once their service is up. Additionally, the GI Bill allows service members who do not use these benefit for themselves to transfer the benefit to their children, so if your mother or father is eligible for GI Bill benefits and chooses not to use them, you can receive money for college in their place. There are also numerous scholarships available from military organizations to benefit the children of living or deceased veterans. Students who are part of a military family should make sure to check whether they qualify for these benefits before making a final commitment to a student loan.